With the upcoming July 24th release of Exkee's first WiiWare offering ColorZ, we thought it might be a good time to get in touch with the developers in order to find out a bit more about the game. Romain Streichemberger, Production Director at Exkee, was kind enough to take time out of his busy schedule to answer some of our questions. You can find out what he had to say to Nintendo Life in the interview below. Nintendo Life: Can you tell us a bit about your company to start with? Romain Streichemberger: Exkee was created in 2003 and now is based in Marseille, France. We first began with the mobile phone industry, we did some porting like Tomb Raider: Legend and Age of Empire. Then last year we released a PC Game called I-Fluid. It's available as a retail release and also on downloadable websites like Steam, Nexway, etc… Then we decided to move to the console platform. Wii is our best target for now. NL: How long has ColorZ been in development? 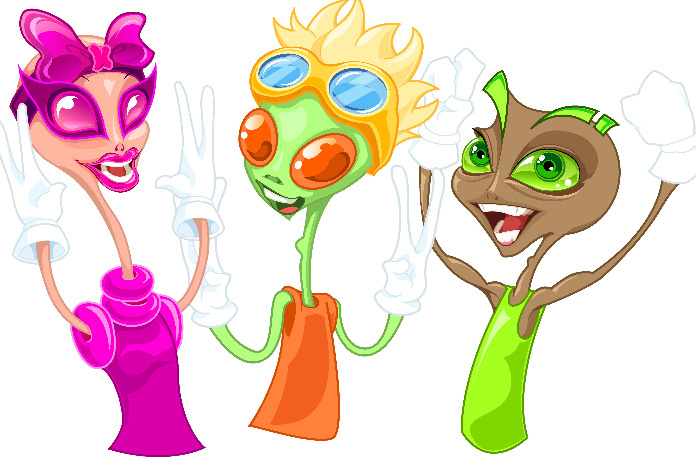 RS: The development of ColorZ took approximately 1 year. NL: How did you come up with the idea for ColorZ in the first place? RS: First, our goal with Colorz was to do a very innovative game and also we really wanted to take advantage of the WiiMote capacities. It came to my mind the idea of controlling multiple entities for a single player and the idea of using color properties. NL: Can you tell us a bit more about the actual gameplay in the game? RS: The story is simple - a new virus polluted the universe and you have to clear all the microbes. The main property is that you can eat a microbe if it is of the same color as yours. 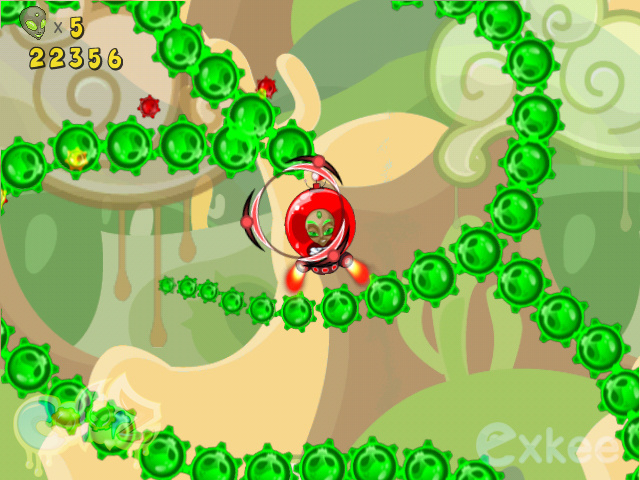 The complexity is based on the fact that you can drive up to 3 UFO’s and you can do fusion! For example if you have to eat Yellow microbes then you have to make fusion between the red one and the green one. It’s the light color addition rule. NL: We've heard the game compared to Ikaruga in terms of the color-switching game play feature. Did Ikaruga or any other games have any direct influence on ColorZ? NL: What controllers are supported in the game? RS: In Solo Mode you have to play with the Wii Remote and Nunchuk, but in Multiplayer mode you can play with the Wii Remote only. NL: ColorZ has a very vibrant visual style? Was there a concerted effort to make the game visually dynamic? RS: The game is based on the colors, so we really wanted a vibrant style. Simple but efficient! 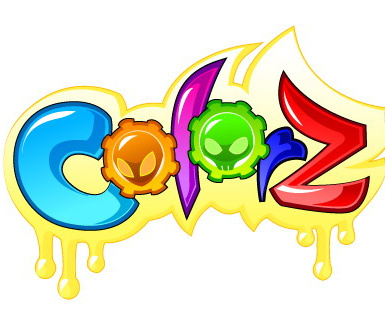 NL: What makes ColorZ stand out from many of the other WiiWare releases we've seen so far? 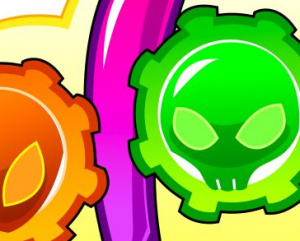 RS: ColorZ gameplay is really unique; you have a feeling when driving multiple UFOs that is totally new. Solo mode will be a tough challenge and the multiplayer is REALLY great. The cooperation in multiplayer is absolutely amazing. You have to talk to each player like “Hey Red Player come with me! 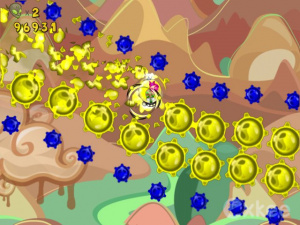 We have to make fusion in order to pass these yellow microbes! !” It’s very funny!! NL: Do you know when we can expect a release of ColorZ in the various regions? RS: In Europe, the game is approved by Nintendo, so we hope for a release really soon. As for North America, we are currently doing certification with Nintendo. As for Japan, we'd love to release it if a publisher is interested. NL: Has a price point been set yet? NL: Did you find it challenging to stay within the 40MB file size limitation of the WiiWare service? NL: Are there any WiiWare titles that have really impressed you? 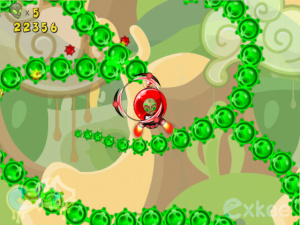 RS: There are great games on WiiWare like Lost Winds or World of Goo. But I want to salute Icarian : Kindred Spirit. It has some great gameplay and is great looking. I am sure the young Spanish development team behind it will do more brilliant games. Salute to Roberto. NL: Do you currently have any other projects in development? NL: Is there anything you'd like to say to our readers in closing? RS: Thank you for reading me! NL: We thank you for taking time out of your busy schedule to take part in this interview. Again we here at Nintendo Life would like to take the time to thank Romain for taking the time to do the interview with us. You can also check out the official gameplay trailer below for a taste of what the game has to offer. Being a huge fan of Cave and Treasure, I gotta check this one out for sure! Hurry up with that certification process, NoA! I just looked up I-Fluid (never heard of it before), and that looks quite interesting, too. I don't think there's another WiiWare game I'm looking forward to as much as Colors. I like the strong Ikaruga vibe, but it's quite distinct from that game, too. I'm sure both modes will be fun, but I'm particularly interested in co-op. I like games that force you to talk with the other players. I downloaded I-Fluid on Steam a few weeks back. It's actually pretty brilliant. A bit buggy at times, but the concept is really fresh and different. I'm looking forward to seeing what else they have to offer. They should release a gameplay trailer for this, while the game certainly seems interesting it's difficult to get a grasp right now on what exactly the gameplay is like. Some elements remind me of Evasive Space. Looking forward to this one. After this game (which actually looks very interesting), I swear I'm not buying a single game from a company that uses "LOL" in an interview. That's worse than any "puppyboobs" in my book. There is a trailer for it. We've had it since April. Looks interesting but I need a gameplay vid to completewly understand what's going on. Anyway, looks nice. Whoa, only 700 points? Awesome! 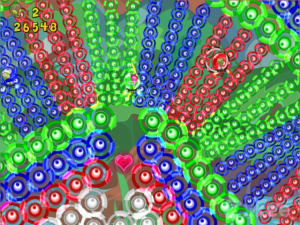 I just love how trippy and bizarre this game looks! The fact that the developer is inspired an awesome SHMUP like Ikaruga makes this game even more enticing! I hope they can pull this off! seriously...recipe for getting me interested in your game/company = mention Cave and Treasure as influences. Looks pretty and sounds interesting so it's on the radar for sure! Strikes me as odd to namedrop Treasure and Cave like that... I mean, it's not the same genre even. 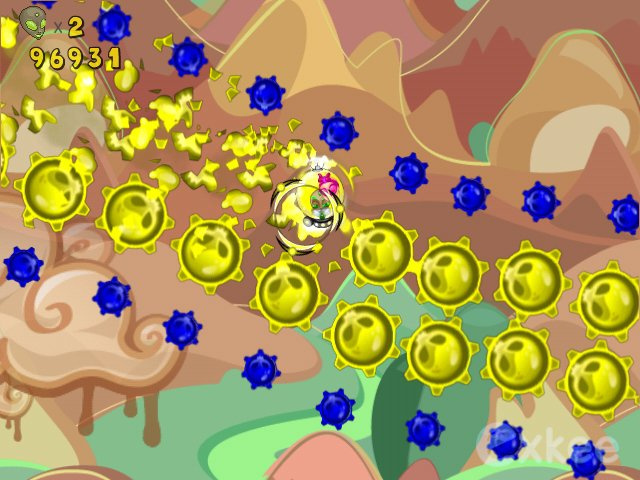 The game itself though, it does look more interesting than most puzzlers on WiiWare... But it's still a puzzle game on WiiWare and unless you're doing something exceptional with your game (like World Of Goo) I can't really get myself to care about it. This has been on my radar since its announcement but it isn't an insta-download unlike games like Arkanoid Plus, Night game (barring any control issues), Lost Winds 2 (what's going on with that one?) etc. I need a review for this one. Djungelurban, I don't think it's odd. It's clearly inspired by Ikaruga. I think of it as an inverted shoot-em-up. Instead of trying to dodge the bullets, you're trying to hit them. WiiPerson, I hope so. I'm not a fan of the random "S" to "Z" title changes, but heck, I'd play it even if it were called Color a Dinosaur 2. Oh wow, these are the iFluid guys? That game looked really cool. Definitely worth seeing how this one turns out. This game certainly looks interesting. Also, it looks like it'll be a blast to play with some people. I'll definitely wait for a review or two to see how this game pans out. Good luck to Exkee! I'll wait a review for it. It's very interesting. Both ColorZ and I-Fluid look really cool. 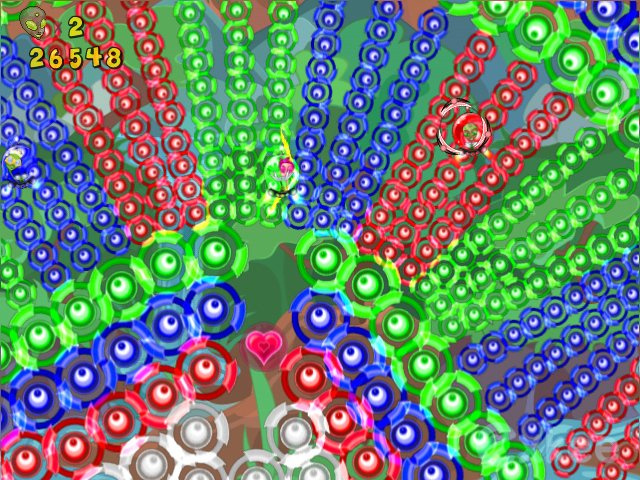 My PC isn't beefy enough to play the I-Fluid demo, but I'll be sure to check out ColorZ when it hits WiiWare!